Welcome to Highland Place ~ Enjoy this spacious East Valley 3 bedroom home which is conveniently located in a desirable neighborhood between I-60 and the 202 Freeway. This Gilbert location is a perfect home-base for shorter stay vacations in the Valley or exploring throughout Arizona. It is also a choice home for longer stays such as winter visitors, relocation to the Valley and business/medical circumstances, as the local school system and local hospitals are excellent. MD Anderson Cancer Center and Banner Gateway Medical Center are just 3 miles away. Of course, negotiated lower rates apply for longer stays. The home is situated to take advantage of three spring training facilities, numerous golf courses and several driving ranges as well as nearby hiking, biking and cycling trails for the sports enthusiasts. Otherwise, you can enjoy the diverse casual and fine dining, sports bars, shopping malls and theaters in the local neighborhood. There is a local Riparian Water Preserve, Gilbert Heritage District and The Farm at Agritopia to enjoy. For the adventurer, take a 25 minute drive to Old Town Scottsdale with its unique art galleries, the Biltmore Hotel and Talking Stick Casino. The Renaissance Festival, Gold Canyon, Goldfield mining town, the Superstition Mountains and Usery Mountain Regional Park are also within a 25 minute drive. For longer day trips, you can explore Sedona, Flagstaff, Roosevelt Lake and Tortilla Flats. If you prefer to relax then you have chosen a comfortable home which is tastefully furnished and perfect for either relaxing or entertaining. The home has high ceilings and large windows which look out over a secluded landscaped backyard. There is a formal dining room and living room for entertaining. A comfortable family room has a leather sleeper sofa, a “two-seater” recliner couch and flat screen TV with DVD player. This makes a great retreat to socialize as the room spills out onto the covered patio with outdoor furniture, a barbeque grill and a lava rock gas fireplace. 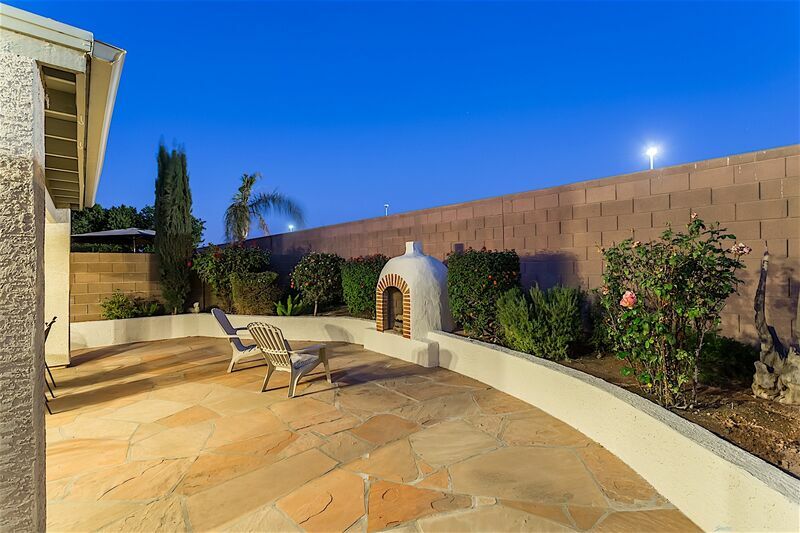 You can sit on your patio sipping morning coffee, an evening glass of wine or enjoy an afternoon barbecue. There is a very large and airy kitchen with seating for 6. It is supplied with everything you need to cook during your stay. Costco and supermarkets are just minutes away. The large master bedroom has a dual vanity, a Jacuzzi tub, separate shower and private toilet. It is situated on the opposite side of the house, away from the activity of the kitchen and family room. There is a new king-size bed and a flat screen TV so you can relax. On the opposite side of the house are two more bedrooms each with comfortable queen-size beds. An organic futon adds additional sleeping capacity in the living room. The second bathroom has a single vanity and shower/tub combo. The neighborhood has a HOA and 2 community playground facilities. The Southwest Regional Library and The Farnsworth East Valley Family YMCA (with outdoor swimming) are just minutes away. Big League Dreams is an expansive baseball park complex which hosts tournaments and events and is just 2 miles away. The Hale Centre Theatre is a 350 seat theater putting on shows throughout the year. Lastly, for the health of our guests, this is an environmentally safer home. All sheets and towels are white and able to be bleached. The mattresses are protected with organic allergy covers. The home was painted with no VOC paint. No pesticide has been used in the interior with exterior organic pesticide used only as needed. The yard is weeded by hand and not sprayed.